White nationalists staged a rally near the White House here but were vastly outnumbered by throngs of counter-protesters. 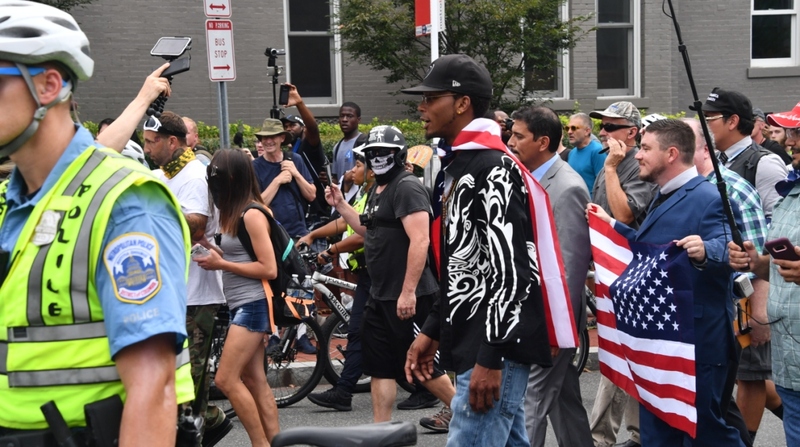 The showing from “Unite the Right 2” participants fell far short of the hundreds that organiser Jason Kessler was expecting for the rally on Sunday, reports CNN. About 400 people had initially been expected at the rally but only about 20 far-right supporters attended the demonstration, which came a year after clashes in the first edition of the rally in Charlottesville, Virginia, left one person dead and elevated racial tensions in America. Kessler blamed the low turnout on logistical issues and confusion regarding the group’s transportation. A small stage and speaker system was set up at the Lafayette Park, where attendees stood silently and listened to a slate of impromptu speakers. Everywhere they went Sunday afternoon, “Unite the Right 2” rallygoers were confronted by counter-protesters, who had been gathering throughout the day as part of a series of demonstrations led by members of 40 anti-racism groups. “Our message is to let everyone know we support each other,” said Maurice Cook, a co-organiser for the March for Racial Justice, which organised the “United Against Hate” counter-protest in the city’s Freedom Plaza. Sunday’s demonstrations and the opposing rallies took place against a backdrop of heightened racial tensions in the US, CNN reported. Recent months have seen a series of high-profile incidents in which police were called on people of colour for innocuous acts, like napping in a dormitory common room, having a barbecue and going to the pool. This week, NFL players in the first pre-season games resumed their protests over police brutality against blacks by raising their fists, kneeling or sitting out during the National Anthem. President Donald Trump condemned last year’s events in Charlottesville in a tweet on Saturday morning, saying they “resulted in senseless death and division”.